The prayer Jesus teaches in Luke 11:2-4 follows the pattern of the commandment to love God with heart, soul, strength, and mind and our neighbors as ourselves (Luke 10:27). Only after the prayer is grounded in God’s person and reign do we move to requests that reflect our personal needs, our relationships with our neighbors, and the struggles of our own souls. 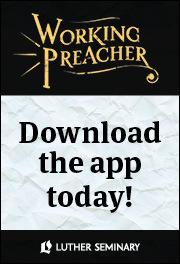 The WorkingPreacher program suggests four weeks for this text. If you have longer, you may wish to take a Sunday for each petition and possibly one for the address, “Father,” which is immensely rich but also immensely difficult for some. Following the four-week program, I have focused on the grounding of the prayer in our love for God, with a week for the address and for each of the first two petitions, then a week for the three petitions related to love for neighbor and self. With the first petition, we recognize God as the source of holiness and express a desire to approach God with the joyful reverence of love. Mary says something similar at the beginning of her poetic praise (Luke 1:49). The Greek word translated “hallowed” is elsewhere translated “sanctified.” God makes us holy with the gift of the Holy Spirit, and when we receive that gift, we find in ourselves the beginning of the answer to this petition, the beauty of holiness at work in our lives in a way that makes God feel at home. We witness a brilliant display of the work of the Spirit in Luke 1-2 and can imagine what this breath of holiness might create in us: joy, wisdom, impossible newness, life. Embracing the gift of the Spirit in our lives hallows God’s name, drawing attention for us and those around us to the fullness of God’s holiness present in the created world. When we ask for the coming of the kingdom, we are again asking for a gift God wants to give (Luke 12:32). The kingdom has indeed already been revealed in Jesus (1:33; 11:20; 17:20-21). But there is a sense in which it is still underground or hidden like yeast in un-risen dough (13:18-21), still to be revealed in fullness (21:31; 22:16-18, 29-30). In the meantime Jesus’ followers are to proclaim it, as Jesus proclaims it (4:43; 9:11; 10:9, 11), which means coming to know it for what it is; good starting places are Mary’s poem (1:46-55), Jesus’ mission statement (4:18-19), and the sermon on the plain (6:20-49), which opens with the promise of the kingdom to the poor. The kingdom is both a gift and something for which we strive, a place we want to enter (18:24-25) and in which we hope to live, so our prayer for its coming is also a prayer that we would know how to equip ourselves to be citizens and would be about collecting the treasure that matters in a place where the only currency is love. With the fourth petition, we are invited to turn to God in the small (relative to the coming of the kingdom! Luke 4:4) but urgent matters of our lives and, like the ravens and lilies, learn to trust in the Father’s mercies new every morning because the Father knows already what we need (12:22-24, 29-31). The prayer recognizes that we do need the essentials of life day by day, but only enough, not dangerous excess. Inherent in the petition is a hope that we will neither fret nor hoard, but beyond that is a desire to be so fully present in the small day-to-day things of life that we will be able to sense Jesus’ presence even in the breaking of our bread (22:19; 24:30-35). Forgiveness appears as a key theme throughout Luke (e.g., 1:77; 3:3; 7:36-50; 24:47). “Release,” another translation of the word for “forgiveness,” appears twice in Jesus’ mission statement (4:18) in release for the captives and the oppressed. Forgiveness is release from spiritual oppression --- for the forgiver as much as the forgiven. Both God’s forgiveness of us and ours of our neighbors figure in this petition, not because God will not forgive unless we forgive first but because we are called to model our love on God’s (6:34-36; 17:26). In forgiving others, we free ourselves to experience God’s forgiving love more fully, which makes it possible for us to love still more (7:47). The reference to release from debt here (also 7:41-43) reminds us that our relationship with money shapes our hearts (18:18-27; 19:1-10). Finally, we request deliverance from temptation (NRSV: “time of trial”) that can cripple or destroy the soul (Luke 8:13). Immediately after the Gospel opens with a burst of Spirit-filled joy and shortly before it closes in the same way, we find references to the sort of temptation in question here. Jesus is tempted by the devil (4:2) even before his ministry begins; then when Satan has found his moment (4:13; 22:3), Jesus twice interrupts his own prayers for deliverance to tell the disciples to pray that they may not come into temptation (22:39-46). But the Spirit who fills with joy also leads Jesus through the wilderness (4:1) and teaches Jesus’ followers when they face their trials (12:12), so this final petition leads us again to the gift of the Spirit (11:13). The fire that will inspire and guide Jesus’ disciples also clothes us in power (24:49). 1 For a lectionary piece on Luke 11:1-13, click here. 2 Those whose experience of earthly fathers has been complicated or destructive might consider other words for this relationship. This podcast discusses the four-week summer preaching series on the Lord's Prayer, Aug. 14 - Sept. 4, 2016.